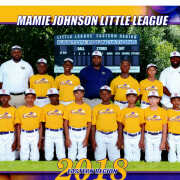 Volunteer your time to support Mamie Johnson Little League We are looking for coaches for baseball and softball as well as volunteer umpires. We also have opportunities to volunteer your skills if you are good with technology, social media as well as organizing. Up to 4 to 8 hours per week.